Although it had not been officially announced, it was already being widely reported last night that the Spanish cycling federation RFEC has notified three-time Tour de France champion Alberto Contador of their decision to hand him a 12-month ban after his positive test for trace amounts of the banned drug clenbuterol at July’s Tour. However, this is likely to be only the first step in a protracted legal wrangle which is unlikely to be resolved before the 2011 Tour kicks off. If upheld – Contador has ten days to lodge an appeal – it means the 28-year old would be stripped of his 2010 Tour win, making him only the second winner of cycling’s biggest race to lose his title for a doping offence (after the recently retired Floyd Landis in 2006). The official verdict is expected to be announced some time between the 10th and 15th of February. A positive test would normally carry a mandatory two-year ban, but RFEC appears to be taking the case of Alessandro Colò as precedent for a shorter sanction. The Italian cyclist also tested positive for clenbuterol at last April’s Tour of Mexico, but had his punishment halved by the Italian Olympic Committee because of the high occurrence of the drug in cattle in the region. Also last year the Court of Arbitration for Sport (CAS) accepted the explanation of American swimmer Jessica Hardy that a similar trace-positive for clenbuterol was the result of inadvertently taking a contaminated food supplement, refusing the World Anti-Doping Agency‘s (WADA) request to extend her ban from one to two years. And 2009 Giro d’Italia runner-up Danilo di Luca had his ban for CERA mitigated to 15 months after “co-operating with the authorities”. Contador’s defence is that he unknowingly ingested the banned substance via meat which was brought to the Tour from Spain. Use of the drug in cattle which will be used for human consumption is illegal in the EU, and Contador has never provided any substantive evidence to support his claim. There is also the evidence of a separate test carried out on another sample he provided, which showed the presence of plasticisers commonly used in transfusion bags, pointing to the possibility of blood doping – which is also illegal – which provides an alternative explanation for the one-off appearance of a trace amount of the drug in Contador’s sample. However, this test is not ratified for use by WADA, and consequently the evidence is not admissible as part of the disciplinary process. Nonetheless, it is interesting data – and somewhat less anecdotal than Contador’s protestation of innocence. An apparently small but important detail which could shape the legal landscape for the next few months will be the date from which Contador’s one-year ban is applied. Contador’s offending sample was given on July 21st, and to the best of my knowledge he was notified of the positive result on August 24th (although some reports put it as early as the 23rd or as late as September 30th). In any of these cases, a 12-month ban would render him ineligible to compete in the 2011 Tour de France, but depending on the ban’s start date, he might be able to compete in this year’s Vuelta a España – a race he won in 2008 – which starts on August 20th. My understanding is that there is no precedent for starting the ban from July 21st, but if it is applied from the August date and – hypothetically speaking – reduced from 12 months to, say, 12 months minus one week, that would pave the way for him to participate in the Vuelta. Short of his ban being overturned – a process which will drag on into the summer anyway, during which he will remain suspended – this is probably the best-case scenario for Contador. Contador is currently attending his Saxo Bank-Sungard team’s training camp in Majorca. He and team boss Bjarne Riis are scheduled to hold a press conference tomorrow afternoon, at which his next move should become clearer. He has previously threatened to retire if banned – this seems unlikely – but there is a strong possibility he will lodge an appeal with CAS, setting in motion a process which normally takes at least six months to resolve. Equally, there is a possibility that either WADA or cycling’s governing body, the UCI, will seek CAS’s intervention to lengthen the ban. I suspect this is unlikely. There is both enough doubt (in a legal sense) and enough precedent to suggest they would be pushing water uphill in seeking a longer suspension. Putting the legalities of (a) what is and isn’t admissible as evidence and (b) what is proof and what is merely circumstantial supposition to one side for a moment, here is my opinion. No new facts, no deep insight – just my interpretation of the sometimes garbled evidence which is available in the public domain. Even though he will be labelled simplistically as yet another doper by a lazy mainstream press, Contador’s ban is merely for the presence of clenbuterol in his system. There is no definitive judgement about whether the drug was ingested deliberately or not. Ignorance alone as a defence may lead to mitigation but not exoneration. In that sense alone, Contador is ‘guilty’. However, while Contador’s contaminated beef story is plausible, in the absence of hard evidence it is little more than a fairly tale. It is a possible explanation, but it is also both unlikely and unconvincing. What seems more likely is that Contador, who was at that point in the Tour below his best and locked in a close battle with Andy Schleck for the yellow jersey, received a transfusion of his own blood provided earlier in the season to boost his performance in the tough Pyrenees stages which followed. That transfusion still contained a trace amount of clenbuterol – which could have been used for muscle-building and fat reduction in training – which had not yet fully decayed. And the concentration level at which it was found in the Cologne lab was much lower than other labs are able to detect, something he would not have been aware of. Let us not also forget that Contador was also under suspicion in Operación Puerto – the scandal which engulfed Jan Ullrich and Ivan Basso, among others – although he was quickly cleared by the Spanish authorities. I make no judgement one way or the other on that one. All the above is an extrapolation of the evidence we already know about. There have been strong arguments for and against that theory for the past few months, but that is what I believe occurred. In a legal sense, Alberto Contador is guilty of ignorance but under strong suspicion of being a more complicit accomplice in a systematic attempt to gain an unfair performance advantage. In my mind, you can forget about all the legal qualifiers: he is just plain guilty. I genuinely hope I am wrong – cycling needs another major doping scandal like I need to amputate a toe. However, I strongly suspect I am not. 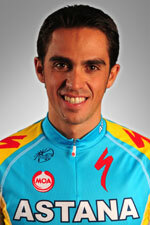 Whatever happens, do not expect the story to end with a simple acceptance of the suspension by Contador. I have previously wondered whether this case might prove to be the beginning of the end for Contador. In reality, we now stand at the end of the beginning of a long and winding road. Who knows where it will ultimately take us? It has been a long time coming, but Alejandro Valverde was finally given a backdated two-year global ban yesterday evening by the Court of Arbitration for Sport (CAS). He will be unable to compete again until January 2012, meaning he will be unable to defend his Vuelta a España title in September. The Spanish Caisse d’Epargne rider had already been banned from racing in Italy by the national authorities there, a sanction which prevented him racing in both the 2009 Giro d’Italia and Tour de France (part of the latter being run on Italian soil). Valverde was one of the most prominent names identified in Operación Puerto, nearly four years ago. A bag of blood labelled Valv/Piti – Piti was the name of Valverde’s dog at the time – was found to contain traces of the banned blood booster EPO (erythropoietin), and this were positively matched by the Italians against DNA taken from a sample of Valverde’s blood at the Tour de France when the race crossed into Italy in 2008. The decision to ban is fair after you look at what happened to guys implicated in Operación Puerto. And let’s see the other Spanish athletes (football, athletics, tennis etc) brought to justice the same way. Good for one, good for all. Laudable though this objective may be, it seems unlikely. The Spanish cycling authorities have been noticeably reluctant to pursue any cases, and the potential furore – and lawsuits – that would accompany, say, any La Liga footballers being exposed for doping would suggest that other sports are unlikely to break the mould. The International Cycling Union (UCI) is satisfied by the decision of the Court of Arbitration for Sport (CAS) on the Alejandro Valverde case. Mr Valverde has been suspended from all competition for two years commencing 1 January 2010. By deciding to suspend the Spanish rider, the CAS agreed with the UCI, which had appealed in 2007 together with the World Anti-Doping Agency (WADA) against the refusal of the Spanish Cycling Federation to open disciplinary proceedings against Mr Valverde for his involvement in Operation Puerto. The UCI and cycling as a whole have certainly suffered greatly from this affair. The damage caused by Mr Valverde’s behaviour since the UCI became convinced of his guilt cannot be fully compensated for by this regulatory sanction. Nevertheless, the UCI is now relieved and contented with CAS’s decision as it resolves a situation that had become untenable. Following the CAS’s decision, Mr Valverde will not be allowed to participate in any cycling events before 31 December 2011. Furthermore, he has been disqualified from all competitions in which he has competed since the beginning of the year and all points allocated to him have been removed. Mr Valverde must also return all prizes received. The UCI World Ranking has been modified accordingly. Valverde’s suspension includes the annulment of his 2010 results to date. (The UCI and WADA were unsuccessful in attempting to get earlier results voided, meaning Valverde’s 2009 Vuelta win will stand). 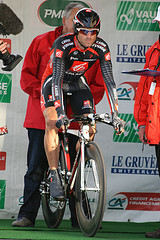 However, Cadel Evans – fifth at the Giro – is consequently promoted to the number one ranking to go alongside his rainbow jersey, having won the 2009 World Championship road race. It has taken a long and protracted legal battle to finally reach this point, and yet the weight of evidence against Valverde has always (to my untrained eye) appeared more conclusive than against, say, Ivan Basso, who has already served a two-year ban and, of course, won the Giro on Sunday. Valverde, naturally, has already announced he will appeal against the ban, calling it “totally unjust and illegal”. Now I’m no expert on the intricacies of anti-doping procedures, but while it does appear that the case against Valverde was constructed in a somewhat unorthodox manner, CAS were satisfied that the blood was indeed his, and that the positive test result for EPO was authentic. I, for one, will be hoping Valverde’s appeal is unsuccessful. I suspect most neutral observers would agree. As expected, Ivan Basso completed his second Giro d’Italia win yesterday, negotiating the 15.3km time trial around Verona safely to win by 1:51 over Caisse d’Epargne‘s David Arroyo. But, as I stated yesterday, it is difficult to be 100% enthusiastic about a victory by a cyclist whose career is forever tainted by his role in the Operación Puerto doping case. Ultimately, there was no repeat of the dramatics of last year’s closing time trial, where Denis Menchov crashed on wet cobbles almost within sight of the finish, only to pick himself back up and complete his win. This year’s Verona finale – over cobbles again, but thankfully dry – was won by Saxo Bank‘s Gustav Erik Larsson in a time of 20:19. Basso finished 42 seconds down in 15th place, but crucially ahead of Arroyo, the only man with even a remote chance of beating him. 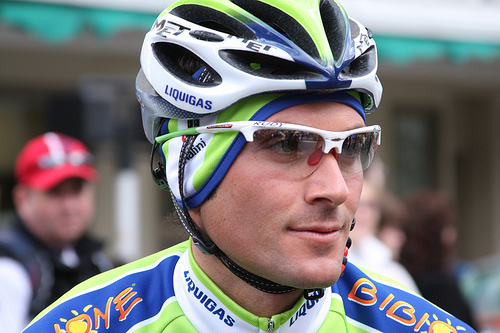 Basso’s first Giro win came in 2006, but was followed twelve months later by a two-year ban after he was identified as one of several cyclists in the Operación Puerto blood doping investigation, including 1997 Tour de France winner Jan Ullrich and Michele Scarponi, fourth overall in this Giro. After his ban expired in late 2008, he placed a strong fourth in both the 2009 Giro and Vuelta a España, but this was the first time since his return he has truly looked like the rider previously identified by Lance Armstrong as one of his biggest threats at the Tour. It is too simplistic to point the finger at Basso and say that his race-winning performance over the past three weeks is evidence of a once-guilty man – he has never admitted to more than an intention to engage in blood doping – sinning again. To do so is tantamount to branding any competitor who wins any sporting event as a cheat, as opposed to one who has earned the right to call themselves a champion through a combination of talent and sheer hard work. At this stage, it is not necessarily meaningful to draw comparisons between Basso and the other leading riders as we do not know who is in peak condition, and who is building up more gradually with a view to peaking at the Tour de France. Certainly, that is the case with Bradley Wiggins, who was openly stating before the Giro started that his 2010 season is all about the month of July. If Basso’s form remains strong relative to the other yellow jersey contenders at the Tour, then – and only then – we will have a basis for some realistic benchmarking. Basso also clearly benefitted from the support of the strongest team in the Giro, with Liquigas placing three riders in the top ten. No other team possessed either the ability to control the front of the peloton the way Liquigas did, or a wing-man of the quality of Vincenzo Nibali (third overall). Both were key factors in ensuring Basso had to expend no more energy than absolutely necessary, a luxury not available to key rivals such as Cadel Evans and Alexandre Vinokourov. In addition, let’s not forget that many of the top riders and their key squad members were absent altogether from the Giro. Vinokourov led a weakened Astana team missing two-time Tour champion Alberto Contador. RadioShack – Lance Armstrong, Levi Leipheimer and all – opted for the Tour of California over the Giro. Saxo Bank placed Richie Porte seventh overall, but this was with very much a second-string squad, missing Andy Schleck, Fabian Cancellara and Jens Voigt (all racing in California) and Andy’s brother Frank. For now, despite my personal reservations about Basso’s past – which he does acknowledge, albeit opaquely – and the possible implications for his current form, we should take nothing away from his achievement. This is a great moment for me in my sporting career. I went through a bad moment and now I am back in a good way. The team protected me 100% and had faith that I could win. This is something important we did as a team. I’m delighted, it was a really tough Giro. This victory is something fantastic, it was a spectacular Giro that was tense right to the end. In Basso’s defence, since his return he has openly posted his training data and blood values online, and also works with Aldo Sassi, one of the sport’s most respected trainers. Pat McQuaid, president of the sport’s governing body, the UCI, also publicly backed the Italian as a ‘clean’ athlete subsequent to his ban. I am pleased to see the battle between Ivan Basso and Cadel Evans. They are superb riders, 100% clean and give a good image to the sport. Whatever you think about its winner, it has been a spectacular Giro d’Italia, with three weeks of close, frequently unpredictable racing, occasionally farcical but always enthralling. In the coming weeks we have some serious warm-up events such as the Dauphiné Libéré and the Tour de Suisse, before the main event of the cycling calendar, the Tour de France, which kicks off in Rotterdam on July 3rd. Make a date.